The United States is unique. It’s difficult to think of another country where its states, cantons or provinces have their own sets of civil and criminal laws. There are some countries — Canada and Switzerland, for example — where cantons or provinces can create laws around issues such as education or whether to allow a pipeline to run through, but they can’t legalize something like abortion or cannabis if it’s not legal at the federal level. But that’s not the case in the US, where each state can pass both civil and criminal laws without permission from the federal government. Of course, those laws can be — and have been — challenged by residents and citizens, which can get said challenges kicked up to the US Supreme Court for an ultimate decision. Once that happens, whatever the outcome, it becomes the law of the land. Offering state leaders the option to create rules that apply only to that state may seem like an idea rooted in the freedom of choice, but in some cases, it’s more about making decisions based on ideology or politics. Using Kansas as an example, some of these landmark decisions, in which the dispute began in another state, in fact changed laws in the Sunflower State. Prior to some of the Supreme Court’s rulings, public schools were segregated, abortion was illegal, and people of different sexes and/or races couldn’t legally marry in Kansas. With the exception of Nebraska to its north, cannabis is legal for at least medicinal use in every state that borders Kansas. This could change, as the newly elected governor favors the legalization of medical marijuana. In the meantime, Kansas remains one of just 17 prohibition states. 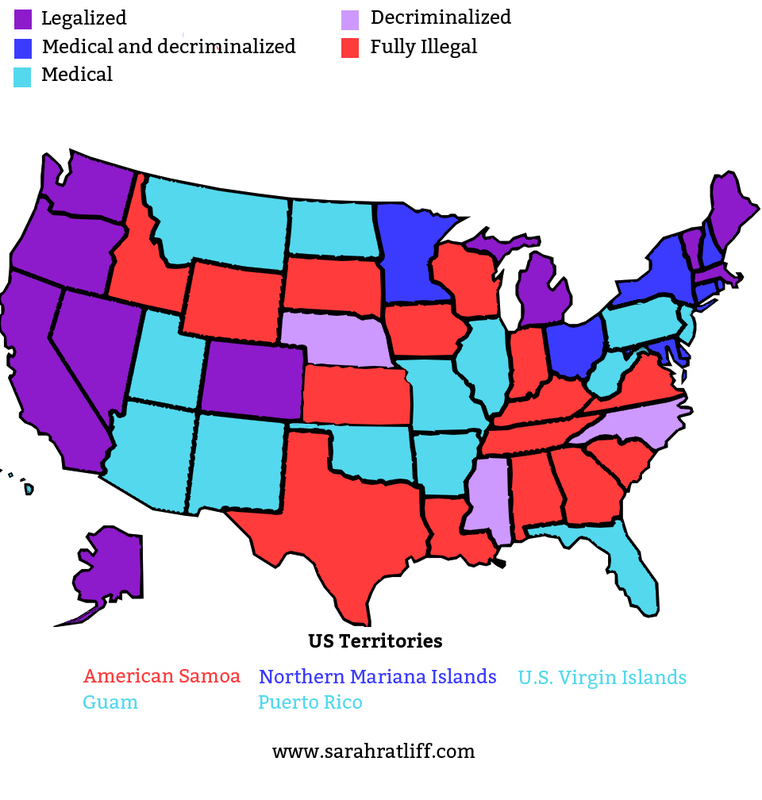 As more states and US territories admit that the war on drugs was a failure (or, perhaps after realizing they can get rich off the very thing for which they spent years incarcerating people of color), there seems to be more attention paid to the states that have legalized cannabis than to the states that are left behind. Ever since Puerto Rico (where I live), legalized medical marijuana in 2015, I’ve spent less time thinking about the legal states and territories and more time feeling badly for people living in prohibition regions. It’s difficult to believe that there are any legitimate reasons for a state to not legalize cannabis for medicinal reasons — and by legitimate, I’m not counting monetary threats to Big Pharma and other “Big” industries. When weighing patient health against religion, politics and/or huge profits, I’ll always choose health. Will those prohibition states eventually fall in line? If so, for how long will they hold out? Will those states continue holding out, citing religious or political motivations? If the fate of cannabis goes by way of the aforementioned Supreme Court decisions, could it be one of these six people who turns the tide for everyone in the US and the one remaining territory where cannabis is not legal? Note: In some instances, I’ve changed the names of the people interviewed. Bethany lives in Texas, and cites the following reasons for the holdout on cannabis: “Texas is a Republican state, controlled at every level of the state government by the GOP. Our incarceration rates are greater than some foreign countries, and as the private prison lobby gives money to elected officials, they target people that make it easier to incarcerate more of the population. This practice is just a continuation of slavery, which is why black people are targeted for crimes and comprise a higher percentage of the population in prisons. Bethany worries that prescription and over-the-counter asthma medications eventually cause potential heart problems and high blood pressure. For someone with a family history of heart problems, this is a serious concern. While living in Maine (prior to legalization there), she was prescribed a daily dose of 60 mg of Vicodin. Although this is within the suggested dosage, risk of addiction at that quantity is serious, and that much acetaminophen can destroy a patient’s liver. 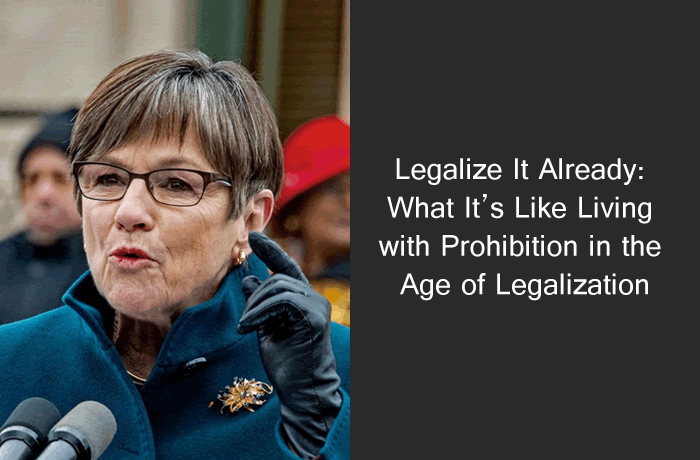 Holly wants the state of Kansas to “listen to your people and look at how other states have benefited from legalization — especially in the areas of funding education and opioid addiction and overdose.” Fortunately for Holly and others living in Kansas, newly elected Governor Laura Kelly is pro-cannabis, so it may not be a prohibition state for much longer. If it were easier to navigate the laws in his state, 62-year-old Eric would use medical cannabis for joint pain. He has friends who regularly consume cannabis to treat their own joint pain, and they report relief. Eric would also use it for anxiety, which occasionally arises. If given the chance, he’d tell his state politicians that they’re missing out on a lot of tax revenue, and Georgians who want it could benefit from using such cannabinoids as THC and CBD. Lucinda lives in South Carolina and has chronic pain from spinal arthritis. She has additional wear and tear on her body due to cerebral palsy and generalized anxiety disorder. She says that South Carolina claims to be in “support” of medical cannabis, but that there hasn’t been enough evidence presented to prove its benefits. Scott had knee replacement surgery about two years ago, and is in more pain today than he was before the surgery. Scott also suffers from insomnia, and he gets between zero and three hours of sleep a night. He was taking 600 mg of Ibuprofen three to four times a day, until he developed bleeding in his GI tract. Tylenol is ineffective for his pain, so he doesn’t bother. For days when his pain is so bad that he’s in tears, he takes one of his “stockpiled” Vicodin. Will any of these six people get so frustrated that they take their fight as high as it will go? If you knew cannabis could be a safe and effective treatment for whatever ails you, how far would you go to fight for it?